Only 2.5 miles from the world famous Las Vegas strip! 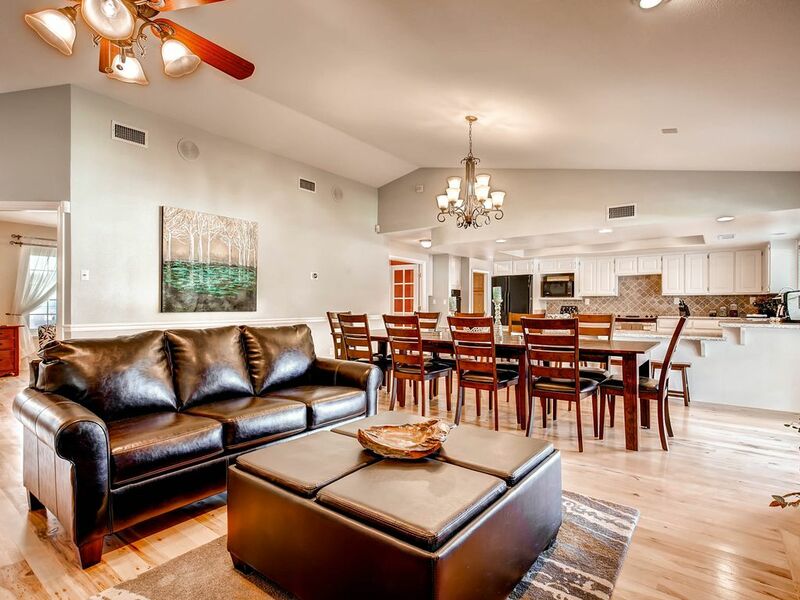 5000+ square feet of Vegas luxury. Private location at end of a cul-de-sac with a driveway capable of parking 8+ cars and/or an RV on an half acre lot. Large pool & spa, putting green and playground. Enjoy the outdoor patio and sitting areas while grilling on the gourmet BBQ grill. Pool table room, poker room, sitting room, gym and theater area. Stocked gourmet kitchen with cutlery, cookware, utensils, Keurig, blender and much more. Dining area seats 16. Enjoy the fresh linens on new plush beds. 70" TV in the theater area. Flat panel TVs in every bedroom with Apple TV, Roku or Direct TV. High speed wireless internet and cable TV. Washer/Dryer. Each guest will receive a bath towel, hand towel, face towel and pool towel. Some complimentary soap, shampoo, laundry detergent, dish soap, K-Cups and paper towels will be provided. Maximum occupancy is 20 people (16 adults maximum). BE INFORMED: Please be sure you book only with legally licensed vacation rentals. In the Las Vegas valley, there are less than 200 legally licensed vacation rentals, the other 5000+ are unlawful and could get shut down at any time. Both the city and county are actively shutting down unlawful rentals, especially over the last year. Many operators try to circumvent the laws by issuing rental agreements for 30 days regardless of the guest's length of stay, but this tactic is no longer working and many are still being closed down, and future guests are left scrambling. Our license number is listed on the website and any legally run vacation rental should list their Short Term Rental License on their listing. A business license is not a Short Term Rental License. The property is owned, managed by licensed real estate professionals. Las Vegas City Short Term Residential Rental License#G63-07561. Less than 8 minutes from the Las Vegas Strip!! Easy access to many restaurants and shops. Cul de sac location for more privacy. This home is beautiful, spacious, and comfortable! It looks like the pictures, but bigger!! Perfect house for our stay! There were 18 people(10 adults, 2 teens and 6 children) staying in this house and it was very spacious. The kids enjoyed the game room, pool room and theater room. The outdoor area is very spacious with a lot to do. The location is great. We had rented a car and it is a quick drive to the strip and we were able to do day trips to Hoover Dam and Red Rock Park. The house managers were very responsive to questions and accommodating with our odd travel schedule. I would recommend this house to anyone! This is a great property for a family get together. The home is clean, spacious, and has lots of great accommodations. And the customer service from the property manager was outstanding. Will definitely be staying here again! We had a wonderful experience at the house. The great room and kitchen upstairs was perfect for our group of 12 for dinners/games/hanging out. There were plenty of bedrooms for everyone - no one was upset by their room choice as they were all great options. The drive to the strip was super easy. We will definitely stay here again. Stayed here a few times. Nice place. We were in Las Vegas for a men's soccer tournament and half the team stayed at this house. It was a great place to come back to between games and at the end of the night to cook meals and relax. Every player commented on what a great place it was. We had an issue with wifi at one point and our hosts were on it! Thank you so much and we are working to book for next years tournament as I write this review. World famous Las Vegas Strip just minutes away. Red Rock Canyon, Hoover Dam, Lake Mead, Las Vegas Ski & Snowboard Resort all less than an hour away.